The modernist design procedure can be described in the terminology of patterns. It made use of natural, social and aesthetic patterns, but only within the locale of the existing site. Natural patterns were the focus of the survey stage. Social patterns had some importance at the analysis stage. A creative leap was then permitted, to produce a design, which resulted in aesthetic patterns. Ideas were largely excluded. The conceptual boundaries of the survey-analysis-design (SAD) procedure were curtailed by the site and by the client's functional requirements. As deductive logic was strongly emphasized, the SAD procedure took on a sad inevitability, like the interpretation of the scientific method on which it was based. Using patterns can place ideas at the centre of the design process. Note that he "wanted a place': a vision of how the work should look led to the selection of the site. The image came first. This is not the modernist procedure, at all. From Beardsley's account, the design process went idea-design-analysis-survey, as shown in the accompanying diagrams. 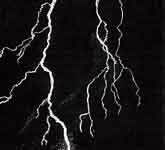 It began with an aesthetic pattern, made by a flash of lightning (Figure 13.5). De Maria then searched for a natural pattern - a landform where "one could be alone with a trackless earth' (Figure 13.6). 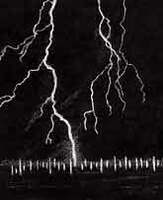 The means of attracting lightning to the earth was a grid of 400 stainless steel poles (Figure 13.7), which could serve as an archetypal pattern for similar projects. The result was unquestionably a work of fine art (Figure 13.8), because it has no function. Social patterns had no place in the design process. This reads like a landscape architecture programme, but the outcome (Figure 13.9) has a cosmic interest, reminiscent of Davis and Shakespeare's diagram. There is "a bridge that is poised between a berm and a conical mound', another earthen ring "seemingly suspended in a circular pool of water', and a "high berm topped with another cone'. It is an abstract composition, dominated by a tertiary pattern that plainly derives from the artist's imagination, not from the existing site and not from the client's programme. A Design Idea occupies pride of place in the design procedure, as the Neoplatonists would have wished. It is even based on circles, which Neoplatonists considered the most perfect forms. Beardsley believes that "if art is thoroughly subsumed under other disciplines or a completely functional intent, it is bound to lose some of its particular magic' (Beardsley, 1984). Perhaps the magic can survive when an artisticidea is accorded a high and privileged position in the design process. To professional designers, the least satisfactory way of producing a design is to start with quaternary patterns. Architects scorn books of house plans. Landscape architects may have an even lower opinion of the "typical plans' that appear in popular gardening books and magazines. But most of the world's buildings are not designed by architects, even in advanced industrial countries, and most of the world's design decisions are not taken by trained designers. Quaternary patterns have great value for makers of objects and places who have not undergone a formal design education. Their use was crucial to the craft design methods that preceded the modern fad for design-by-drawing. Modern, in this context, means post-Renaissance. As discussed in an earlier essay, Alexander's pattern language begins with quaternary/archetypal patterns.